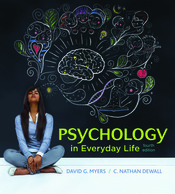 David Myers' and Nathan DeWall’s best-selling and briefest introduction to psychology speaks to all students regardless of their background or level of preparedness, with no assumptions made in the vocabulary, examples, or presentation. Students of all kinds are comfortable with Myers' manageable chapters, which include careful connections to associated visuals, comparative tables, and research-based pedagogy. Psychology in Everyday Life is a high quality and affordable resource for students of all levels. The text and accompanying LaunchPad have been heavily updated to reflect psychological science and students’ everyday lives today.